Overall Height . . . . . . . . . . . . . . . . . . . . 21 in. Overall Width . . . . . . . . . . . . . . . . . . . . 5.25 in. Maximum Frame Width. . . . . . . . . . . . 4.75 in. Overall Length. . . . . . . . . . . . . . . . . . . 12.75 in. Weight . . . . . . . . . . . . . . . . . . . . . . . . . 42 lbs. Overall Width . . . . . . . . . . . . . . . . . . . . 6.5 in. Maximum Frame Width. . . . . . . . . . . . 6.00 in. Maximum Capacity (Pairs) . . . . . . . 50,000 lbs. Available in Wide Top (WT) of Flat Top (FT). Tops are interchangeable and an additional set of tops can be purchased separately. The DL-105/DL-106 steel braces are strictly intended to be used as a pair. Flat top available for offset dump beds and trailers. 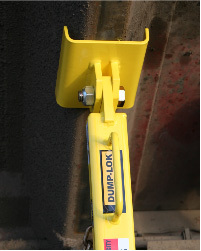 UDL-105/UDL-106 can be used universally on any brand of dump box. UDL-105/UDL-106 can safely hold dump beds at higher angles than manufacturer props, giving employees safe access to a wider area underneath the dump bed. 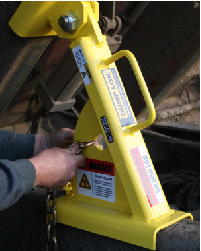 UDL-105 steel braces fit up to a 4 7/16 inch flange – the standard dump truck flange is 3.5 inches. UDL-106 steel braces will fit up to a 5 1/2 inch flange. 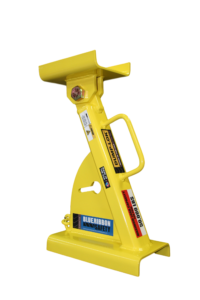 UDL-105/UDL-106 is designed with easy to grip handles, making each steel brace easy to carry and easy to install between the truck frame and dump box. 1. With wheels chocked and empty dump bed raised to the appropriate height, set driver side (left) DUMP-LOK on truck frame, pushing firmly so the top and bottom plates are making full contact with both frames. 2. 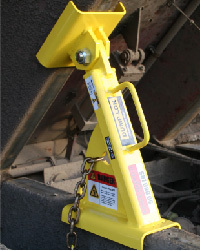 Place safety chain around truck frame or frame cross member. Slide chain through key slot hole. Tighten and lock chain in the small end of the slot. Repeat procedure for passenger side. 3. Slowly and carefully lower the dump bed to secure DUMP-LOK.